Producer: Arnon Milchan; co-producer: Patrick Cassavetti; production coordinator: Margaret Adams; screenplay: Terry Gilliam, Tom Stoppard, Charles McKeown; 2nd unit director: Julian Doyle; assistant directors: Guy Travers, Chris Thompson, Richard Coleman, Christopher Newman, Terence Fitch, Kevin Westley; photography: Roger Pratt; model/effects photography: Roger Pratt, Julian Doyle, Tim Spence; camera operator: David Garfath; video consultant: Ira Curtis Coleman; editor: Julian Doyle; sound editors: Rodney Glenn, Barry McCormick; sound recordists: Bob Doyle, Eric Tomlinson, Andy Jackson; sound re-recordist: Paul Carr; art directors: John Beard, Keith Pain; graphic artists: David Scutt, Bernard Allum; draughtsmen: Tony Rimmington, Stephen Bream; matte artist: Ray Caple; production designer: Norman Garwood; set dressing designer: Maggie Gray; costume designers: Jams Acheson, Ray Scott, Martin Adams, Vin Burnham, Jamie Courtier, Martin Adams, Annie Hadley; make-up: Maggie Weston, Aaron Sherman, Elaine Carew, Sallie Evans, Sandra Shepherd, Meinir Brock; music: Michael Kamen; music performed by: National Philharmonic Orchestra; music coordinator: Ray Cooper; choreographer: Heather Seymour; stunt arranger: Bill Weston; special effects supervisor: George Gibbs; model effects supervisor: Richard Conway; titles/optical effects: Nick Dunlop, Neil Sharp, Kent Houston, Tim Ollive, Richard Morrison. Cast: Jonathan Pryce ( Sam Lowry ); Robert De Niro ( Archibald "Harry" Tuttle ); Katherine Helmond ( Mrs. Ida Lowry ); Ian Holm ( Mr. Kurtzmann ); Bob Hoskins ( Spoor ); Michael Palin ( Jack Lint ); Ian Richardson ( Mr. Warrenn ); Peter Vaughan ( Mr. Eugene Helpmann ); Kim Greist ( Jill Layton ); Jim Broadbent ( Dr. Jaffe ); Barbara Hicks ( Mrs. Terrain ); Charles McKeown ( Lime ); Derrick O'Connor ( Dowser ); Kathryn Pogson ( Shirley ); Bryan Pringle ( Spiro ); Sheila Reid ( Mrs. Buttle ); John Flanagan ( TV interviewer/salesman ); Ray Cooper ( Technician ); Brian Miller ( Mr. Buttle ); Simon Nash ( Boy Buttle ); Prudence Oliver ( Girl Buttle ); Simon Jones ( Arrest official ); Derek Deadman ( Bill, Department of Works ); Nigel Planer ( Charlie, Department of Works ); Terence Bayley ( TV commercial presenter ); Gordon Kaye ( MOI lobby porter ); Tony Portacio ( Neighbour in clerk's pool ); Bill Wallis ( Bespectacled lurker ); Winston Dennis ( Samurai warrior ); Toby Clark ( Small Sam double ); Diana Martin ( Telegram girl ); Jack Purvis ( Dr. Chapman ); Elizabeth Spender ( Alison/"Barbara" Lint ); Antony Brown ( Porter, Information Retrieval ); Myrtle Devenish ( Typist, Jack's office ); Holly Gilliam ( Holly ); John Pierce Jones ( Basement guard ); Ann Way ( Old lady with dog ); Don Henderson ( 1st Black Maria guard ); Howard Lew Lewis ( 2nd Black Maria guard ); Oscar Quitak, Harold Innocent, John Grillo, Ralph Nossek, David Grant, James Coyle ( Interview officials ); Patrick Connor ( Cell guard ); Roger Ashton-Griffiths ( Priest ); Russell Keith Grant ( Young gallant at funeral ). Gilliam, Terry, Tom Stoppard, and Charles McKeown, Brazil , in The Battle of Brazil , edited by Jack Mathews, New York, 1987. Danvers, Louis, Brazil de Terry Gilliam , Brussels, 1988. Gilliam, Terry, Gilliam on Gilliam , New York, 1999. McCabe, Bob, Dark Knights and Holy Fools: The Art and Films of Terry Gilliam , New York, 1999. Rabourdin, D., "Terry Gilliam parle de Brazil ," in Cinema (Paris), February 1985. Roddick, Nick, "Just Crazy about Brazil ," in Stills (London), February 1985.
" Brazil Issue" of Positif (Paris), March 1985. Chaillet, J.-P., and M. Chion, in Cahiers du Cinéma (Paris), March 1985. D'Yvoire, J., in Jeune Cinéma (Paris), March 1985. Pym, John, in Monthly Film Bulletin (London), April 1985. Van de Kaap, H., in Skrien (Amsterdam), April-May 1985. Rushdie, Salman, "The Location of Brazil ," in American Film (Washington, D.C.), September 1985. Rubenstein, Lenny, in Cineaste (New York), vol. 14, no. 4, 1986. Glass, Fred, in Film Quarterly (Berkeley), Summer 1986. Fohlin, J., in Filmhaftet (Uppsala, Sweden), December 1988. Boyd, K. G., "Pastiche and Postmodernism in Brazil ," in Cinefocus (Bloomington, Indiana), no. 1, 1990. Kremski, P., in Filmbulletin (Winterthur, Switzerland), no. 5–6, 1991. Fister, Barbara, "Mugging for the Camera: Narrative Strategies in Brazil ," in Literature/Film Quarterly (Salisbury, Maryland), vol. 24, no. 3, 1996. Robley, L.P., and P. Wardle, "Terry Gilliam," in Cinefantastique (Forrest Park, Illinois), vol. 27, no. 6, 1996. "When I started imagining things," says Terry Gilliam, "I get a chemical high from it. My imagination is a cheap drug, one of my ways of dealing with reality because reality is so complex and uncontrollable." More than most, his career as a filmmaker seems, with its much-publicised crises of finance, production, and distribution, to have been a series of self-imposed demands for the impossible, the direct translation of a private quest into an exotic public entertainment hovering on the edge of disaster. And not surprisingly, the quartet of Gilliam adventures that began with Jabberwocky has one central theme: the triumph of fantasy. In each of his films, the action revolves around a humble figure of unlikely significance—the medieval apprentice ( Jabberwocky ), the schoolboy ( Time Bandits ), the lowly clerk ( Brazil ), the derided outcast ( The Adventures of Baron Munchausen )—who more by luck than good judgement becomes something of a hero after tackling some monstrous opponents. In each film, the "real" world is a cruelly chaotic environment where frantic inspiration and sheer bravado offer the only defence. And in each film, the moment of victory is precariously achieved at the cost of apparent defeat: Dennis must overwhelm the Jabberwock to win the Princess, Kevin loses home and family in the (temporary) defeat of Evil, Sam escapes from torture into placid insanity, the Baron is shot dead before riding off into the sunset where he dissolves like a ghost. It is as if the price of the whole display has been too high, an unavoidable but near-suicidal performance. "I like the Icarus quality," Gilliam confirms, "of flying too close to the sun." Flying high is certainly the escape route in Brazil , the darkest and most coherent of Gilliam's labyrinthine stories. Set "somewhere in the 20th Century (at 8.49 p.m.)," it parodies Orwell's 1984 to convey a less restrained but equally persuasive picture of a not-too-alternate society where nothing works as it should and nobody really cares. 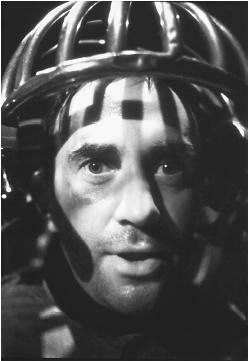 Gilliam's version of Winston Smith, the wild-eyed Sam Lowry, is employed in the warrens of the monolithic Ministry of Information Retrieval—where, naturally, they never tell you anything—his main function to solve the problems of his immediate superior (played by Ian Holm in a memorable portrait of vacillating bureaucracy). At night, Lowry dreams that he's devastatingly handsome in shining armour, equipped with a glorious set of white wings, and goes swooping among the clouds where a blonde goddess awaits him. When he meets a real girl who looks just like his imaginary partner-in-flight he has little choice but to team up with her even though the "goddess" charges about in a huge hell-raising truck with the bright glitter of anarchy in her eyes and is marked for arrest as a trouble-maker. Sam's attempts to extract her to safe "non-existence" from the central computer records are in vain, and they are both doomed. But in his imagination their faraway paradise (its idyllic nature suggested by the words of the popular song "Brazil," which otherwise has nothing to do with the plot) remains intact and their embrace in the sky—anticipating Gilliam's subsequent vision of ecstasy, the aerial dance between Venus and Munchausen—will last forever. The images in Brazil are as outrageous as any of Gilliam's Monty Python cartoons which, with their truncated cut-outs, coils of tubes and pipes, and berserk mechanisation, the film often evokes. What gives it a special force, quite distinct from the more whimsical, fairytale absurdities of his other comedies, is the disturbing familiarity of the elaborately awful settings. The ugly decor of the macabre city, its walls plastered with sinister proclamations ("Don't suspect a friend— report him! "; "Happiness—we're all in it together"), provides an enclosure of disheartening malfunction whose inhabitants are either too numb or too self-absorbed to notice. "I'm dealing with what I think exists now," Gilliam says. "There is a feeling things are out of control . . . ."
A car left briefly parked is instantly vandalised and set alight by playful kids. A guest arrives late to a party and has to be rescued by his hostess from brutish security guards who have attacked him. A terrorist bomb explodes in a restaurant but lunch continues among those diners unaffected by the blast and flames, politely screened from the writhing wounded. Such moments of ruthless humour give Gilliam's retro-future an acute satirical accuracy. Equally startling, though, are the images from nightmare, sometimes Sam's, sometimes Gilliam's, always ours. A vivid portrayal of the city-dweller's predicament comes when the pavement itself sprouts arms that hold the would-be knight back from his mission. And when another gallant rescuer, the resourceful repairman who operates stealthily outside the law, is suddenly caught up in a shroud of waste paper, a breeze blows the paper away and the human figure beneath has disintegrated and gone, a metaphor for lost hopes of reprieve. The city under siege is a constant Gilliam battleground, vividly restaged in each of his films with ferocious bombardments and impressive crowds of scurrying extras. In Brazil , the war bursts in through ceilings and front doors; it even offers the opportunity for a sly reference to Battleship Potemkin , with a vacuum-cleaner instead of a pram on the fatal steps. The underlying contest can also be interpreted as a race against time, partly to save a crumbling world, partly—at a more personal level—to counteract physical mortality. Like the process of filmmaking itself, Gilliam's comedies are beset with giant antagonists (Sam's envisioned opponent in Brazil , a towering samurai, turns out to have Sam's own features), but they also bubble with resilience and humour. "I hope people will catch themselves laughing and suddenly realise, 'I shouldn't be laughting at that, that's horrendous.' That's a nice thing to do to people. It helps us to see we're all in it together."